“God’s Got This”, from Christian Faith Publishing author Dana M. Benson, is a soul-stirring book of praise and prayer, anecdotes, stories, musings, and thoughts, all of which paint a beautiful collage of God’s ever-present love and power during life’s trying times, especially when one takes the leap of faith to get on the path labeled “Jesus,” even in the face of overwhelming obstacles. 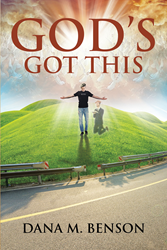 “God’s Got This” is an earnest book testifying to God’s reliability. “God’s Got This” is the creation of published author Dana M. Benson, a Sunday school teacher in Balaton, Minnesota, striving to run the good race and one day become an ordained pastor. Published by Christian Faith Publishing, Dana M. Benson’s new book is a jubilant book of praise, gratitude, and thanksgiving in the midst of life’s storms. Benson brings together slices of his own experience in which the Lord was unmistakably at work, inviting the reader to reflect on their own lives and find that, here too, no matter what, God’s got this. View a synopsis of “God’s Got This” on YouTube. Consumers can purchase “God’s Got This” at traditional brick & mortar bookstores, or online at Amazon.com, Apple iTunes store, or Barnes and Noble. For additional information or inquiries about “God’s Got This”, contact the Christian Faith Publishing media department at 866-554-0919.